Anything goes smoother with the right tool, and if your guy is one who is faced with yard work involving wood clean up, pruning, etc. this would make a great outdoor power tool, gift idea for him. 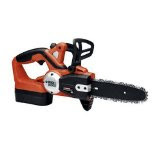 Cordless Electric Chain Saw @ Amazon.com . Click here>> for additional chain saws.